Most people believe that it's OK to put a radio on hold to give callers something to hear while they wait on hold. Actually, that can be quite dangerous. You could be hunted down and prosecuted. A business putting commercial music on hold, no matter what the source...radio, CD, tape, mp3, or even a live band... must have "permission" from the copyright holder for each piece of music played. Permission, of course, is obtained via payment of...ta da...LICENSING FEES of up to $900 a year! ASCAP, The American Society of Composers, Authors and Publishers, BMI, Broadcast Music Incorporated, and SESAC (the letters don't stand for anything) are the three non-profit organizations in the country sanctioned by Congress to disburse royalties collected from businesses that use commercial music to the writers, artists and publishers of that music. It doesn't matter what kind of business uses the music the fees are to be paid. It's how song writers, artists, publishers and others in the music industry earn their livings. Nonpayment of royalties is considered theft of intellectual property and is called "music piracy," or, "intentional copyright infringement." Panalties for ICI can be severe and include jail time, fines, and punitive damage awards. These are not good times for the music industry so they are taking every opportunity to collect royalties wherever they can and the collection arms of ASCAP, BMI and SESAC are busier than ever. With a Hold On AMERICA system, all music licensing fees are included in our costs so that concern is eliminated for you. Over a dozen businesses a day make the switch to Hold On AMERICA on-hold programming. Why? Because our marketing-on-hold programs utilize programming elements, music and copy features all developed through focus group research studies designed to reveal what works and what doesn't work with callers on hold. Our programs get results while our competitor's programs just...well... don't. Learn more about our focus groups on the next page. The average messages-on-hold production company in the US today has been in business for about two years and has a couple of hundred clients. Hold On AMERICA has been in business for 28 years and has over 45,000 active client locations. And, despite corporate closings, mergers, takeovers and everything else, we STILL have over 60% of the clients that started with us back in the mid-eighties. The reason? We're obsessed with how our clients sound on hold. On-hold advertising reaches an audience that is ALREADY INTERESTED in doing business with your company. After all... they called you so it's just logical to tell them about your products and services. And, callers on hold are thee perfect market because they're a CAPTIVE AUDIENCE that's IN THE MOOD TO BUY! On-hold advertising is a marketers DREAM COME TRUE! A Hold On AMERICA system can not only keep callers from hanging up and encourage a dialog betwwen the caller and the person answering the line, it can do wonders for your business image, too. Now, your business can project the same professional image to callers that our other clients, many of which are Fortune 500 companies, do. Your business may be small...you could even be working from your home...but with a Hold On AMERICA messages-on-hold system working for you, your company will sound BIG and impressive. 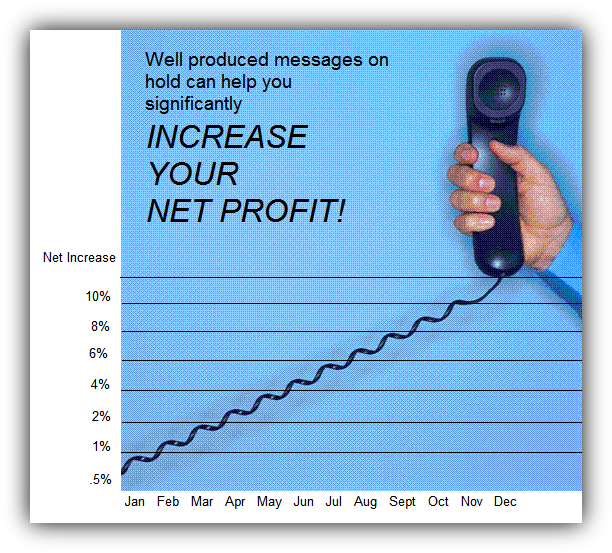 Please visit the other pages on our website to find out how Hold On AMERICA messages on hold can help you significantly INCREASE YOUR NET PROFIT and how you can get them working for your business in as little as a week. CLICK HERE to go to the next page where you can hear a montage of programs that we have done for other clients in the last year or two and learn about our musical jingles and Spanish language programs, too. Copyright 2018 Hold On AMERICA, Inc.